When I woke up this past Sunday, the rain that had promised to let up had not. Heather and I had planned to go hiking but had lots to accomplish that day too. Luckily, Heather had the fabulous idea to head up to Hot Springs for a hike + a soak in one of their mineral hot tubs. So at 11 AM we booked one of their hot tubs for 5:45 that night! 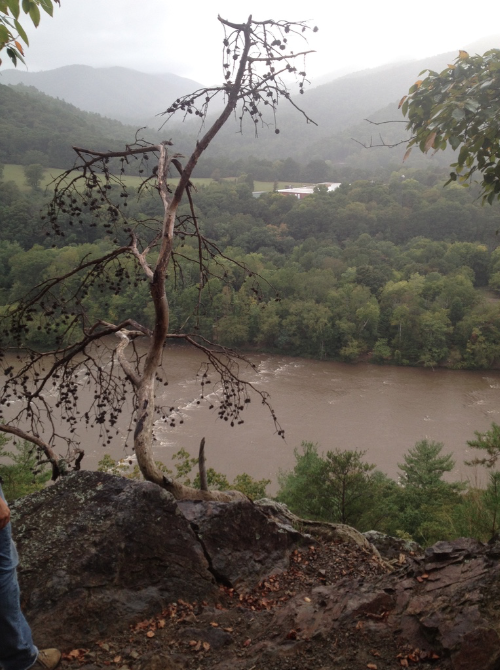 The idea of a river-front hot tub, sans all the harsh chemicals, is my idea of bliss on a cool, rainy day. In the way that happy Sundays can be sometimes, we had the perfect balance of city wandering, nature and relaxation. 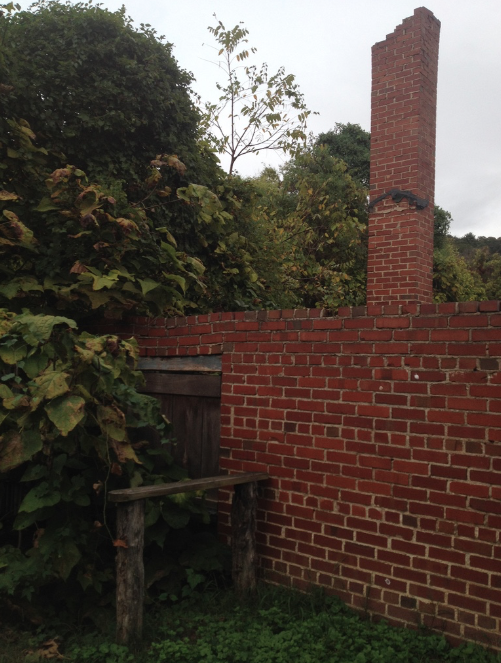 After running some errands and plodding around downtown Asheville, we made the 45-minute drive out to Hot Springs. Since it was raining we left things flexible, with the plan to grab a beer at one of the two bars in town if it was raining too hard or stop off in one of the other little towns along the way. The only way there is via a one-lane road, so we were forced to slow down and smell the horse manure roses. Every time I make a drive like that it makes me think of home and I get all nostalgic. Nothing says Central PA like a 25 MPH speed limit and ramshackle old barns. Makes my heart swoon. And, it was the raining that perfect, misty rain that makes the roads glisten, and lightly enough to crack the windows and listen to the car tires crackle along the wet road. Once we got there the rain stopped and we saw blue skies, so we preserved and went on our hike! We actually did a portion of this same hike a few years ago, but I was enough of a space cadet not to realize we were on the Appalachian Trail! I think it’s so cool that the AT runs so close to Asheville, and Hot Springs is one of the places that it runs right through civilization. We timed the hike so that we’d return with enough time to head over to the Hot Springs Resort and Spa where they rent the tubs out by the hour. The big draw in Hot Springs is just that…the natural hot springs that give the town its name. I learned that the city was founded around these springs and were used by the Cherokee Indians for their healing powers. There is now a “resort” and “spa” along the river which feeds the springs. I use these terms loosely as the amenities are, shall we say, rustic? I, for one, I totally appreciate the utilitarian-ness of these tubs (and the price) but I do worry that a honeymooning couple may one day mistake this spot for a swanky resort. I’ve only been to the tubs one other time, in the dead of winter, and I was honestly a bit cold. Since the tubs are fed by the springs I assume the temperature fluctuates with the weather. But by 5:45 on Sunday, the rain had stopped and it was downright muggy outside. 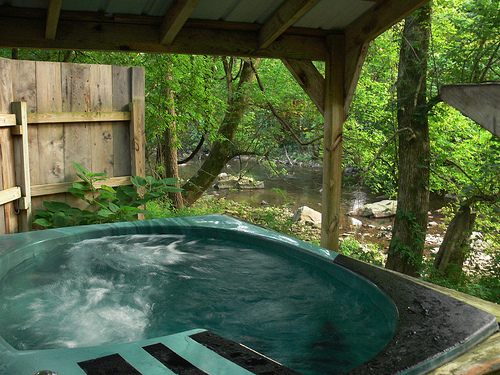 The deal with the tubs is that each one is totally private and you face the river, so you feel pretty solo out there! It was so incredibly relaxing to soak in a hot, bubbly tub outside listening to the river for an hour. The minerals are said to relieve stress + fatigue and increase oxygen + blood flow. I can’t say whether these things really happened, but damn if it didn’t feel fantastic. I was so relaxed driving home that I honestly felt like I was in a dream. Have you ever left a yoga class, totally blissed out and felt like a you’re on another planet? That’s exactly how I felt, cruising the back roads back to Asheville. It was the perfect way to start the new week, I wish I could do that every Sunday! That is so cool!!!! When I come to asheville we have to do this. 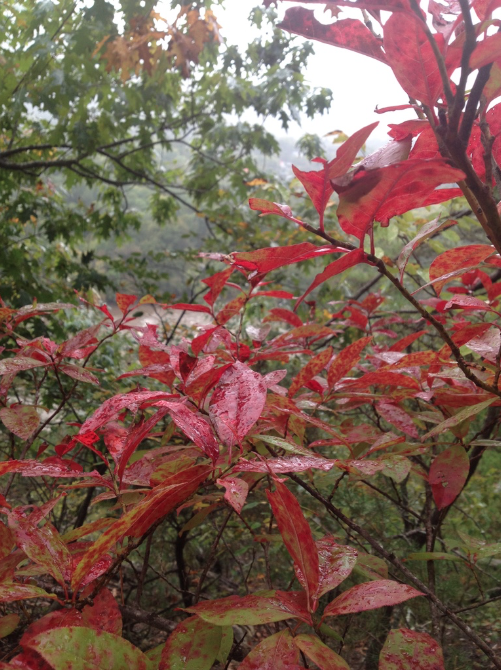 Those pictures make me so nostalgic for the east coast…I miss the foliage!! !